The message resonated in the crowd of localist economy activists, entrepreneurs, and innovators, gathered for the 11th Annual Conference which is being held for the first time in Buffalo. Biomimicry is the science of trying to understand how nature works, how humans are a part of nature, and how humans can better stand a chance to survive and thrive if they adopt important natural principles. “Organisms and the ecosystems and services that they provide for take care of the place so that 10.000 generations from now, there will still be a place” she told the enthusiastic audience. 10,000 generations? How often do we think about our social, economic, and environmental impacts on the next generation? In business, it’s the next quarter isn’t it? The future? -What a concept! Many of the BALLE participants are deep into the politics of economics. The contrasting philosophies and on the ground struggles between the concepts of dog eat dog competition v. the cooperative nature of working for the greater good of building communities and economies from the ground up are consistent themes of the BALLE movement. Thinking about how to move the effort away from the “me”, to the “we” is a fundamental concept of both nature and sustainability. Thinking about how our economy will effect future generations is a substantial characterization of localism. Localists will tell you that if you are a part of a localist movement, you care about the people, the places, and the environment. You come to think about making sure that as the tide rises, all people have floatable boats. If you have a purely global focus, you work to extract of wealth and ignore the damage to the environment and society, justice issues that become nothing more than “externalities” to the profit taking. Although it is still considered heretical in many scientific circles, Benyus said, “science is more and more discovering that cooperation, or mutualism, has a strong place in the way that systems, ecosystems survive”. In other words it is not just about survival of the fittest. Parts of systems work together to create the healthy whole. Biodiversity requires mutualism and cooperation. Biodiversity creates opportunity and sustains life. As an example she describes Mycorrhizal Fungi. “Living soils have dense networks of this fungi that connects organisms and serves as both a communication system and a support system in terms of helping to share water and nutrients amongst organisms.” “We call it the Common Mycorrhizal Network (CMN) and it connects, defends, and supports the world. It is part of the symbiotic and deeply shared cooperation that characterizes how an organisimistic society knits together.” This is a profound description of how a cooperative system allows biodiversity to flourish and life to thrive. It is more than a metaphor about how our economic system is modeled. “This mutualism demonstrates that ecosystems are generous rather than strictly competitive,” Benyus tells us. She continues. “Humans are mostly oblivious to this. Our factory agricultural system is intent on killing soils and introducing synthetic toxins that destroy biodiversity and destroy life opportunities.” Development of any sort pays little attention to how nature survives and thrives, which effects how humans survive and thrive. This knowledge is consequential. Nature is very efficient and natural systems produce no waste. Ubiquitous natural polymers such as cellulose, starch, RNA, keratin, silk, collagen, help to characterize such things as strength, elasticity, and water solubility and help produce the structures of life forms including bones, wood, shells, claws, and spider webs. Natural polymers are biodegradable and are not waste products. Humans have introduced more than 350 non- biodegradable and toxic polymers including polystyrene and plastics. This toxic waste stream is one of the great tragedies of humanity and are direct results and consequences of the political economic decisions of a consumer society. Biomimicry can help us move toward the use of natural or natural influenced polymers, help us reduce waste, and help us to detoxify the planet. Perhaps the fundamental message of the BALLE Conference is about cooperation as opposed to competition. Can human systems including political economic systems find cooperative ways to thrive and help lift all boats. According to Janine Benyus, Lets move from me, to we. Just ask nature. Most people at BALLE2013 would agree. The BALLE (Business Alliance for a Local Living Economy) Conference got off to a big start in Buffalo last night as Hallwalls Contemporary Arts Center hosted an evening with Judy Wicks, co-founder of BALLE. Wicks spent the evening discussing her new book Good Morning Beautiful Business, as a part of the "Get the Rust Out" Speaker Series. The two lived in a small apartment behind the store “which helped keep the costs down” said Wicks. But within a year the couple divorced. Hayne changed the name of the store to “Urban Outfitters” and today remains CEO and President of the well-known chain that today has a net worth of almost $2 billion. He is one of the richest people in the world. A few years later, Wicks started a restaurant called the White Dog Café, which catered to a healthy foods, localist clientele. “We believed in humanely treated food resources such as free range animals, local farms, and fair trade coffee, chocolate, and tea.” Wicks told the crowd. The restaurant, located on Sansom Street in Philadelphia was in a building originally slated for demolition for a new mall. Wicks rallied the neighbors and the restaurant became a hotbed for progressive activism and localism. Speakers including Amy Goodman, Lester Brown, Helen Caldicott, and others helped focus the community on issues ranging from local engagement, health, environment, and the evils of corporate globalization. “These view differed significantly from her former husband,” she told us. The restaurant became a huge success, and the neighborhood was saved from the mall developer. She was able to buy her building and invest in the neighborhood, expand, and move into other entrepreneurial businesses. She was asked to join the Social Venture Network by Ben Cohen of Ben and Jerry’s Ice Cream. SVN expanded into international support for localist and self-reliant businesses in Chiapas Mexico, Cuba, and Vietnam among other places. One thing that bothered her was that even the socially responsible businesses relied on the old model of economics, which promoted growth as the predominant paradigm. Grow or Die, she told the audience, that was the model. “I was more interested in social value beyond the dollar bottom line.” Soon Ben and Jerry’s, Odwalla Juices, Stoneyfield Farms, and Toms of Maine, SVN leaders and icons of the social venture movement were bought out by multi-national corporations. Eventually she helped to co-found BALLE and has inspired countless people to consider business as a vehicle for social change. Buy her book, available today at local bookstores for more details. The question and answer session provided several enlightening exchanges. One woman asked if her success in the Sanson Street neighborhood created an opportunity for “gentrification.” It was hard to dodge that question, and Wicks did not. “If you invest in a neighborhood, make it more livable, property values will increase.” Wicks declared. How did you avoid “Grow or die” asked another woman in the audience. “I decided not to franchise, and instead invested in or started other business’s” she said. Today I am retired and living mostly off rental income from the Philadelphia properties. Another question: “Can you identify one secret to your success?” Wicks responded quickly- “I lived upstairs from the store, and then restaurant, lived and worked in the same neighborhood, grew my kids there, and that saved a lot of time because I didn’t have to commute.” Indeed. Its time to criminalize pollution! Earth Day 2013. Why are we celebrating? -Friend Sandra Steingraber is in Chemung County jail, sentenced for and act of civil disobedience against the oil and gas industry that threatens to turn land and water in New Yorks Finger Lakes into an Armageddon that will visit future generations for what may be the rest of human time. -Three years ago this week BP turned the Gulf of Mexico into one of the worst ecological disasters in the history of the planet. Because of the way the media reports this, many think that this disaster was nothing more than a “spill” and that BP has cleaned up the coast and brought economic prosperity to the citizens and economies dependent upon the resource that was once an ecologically vibrant heart of planet earth. Today, according to many independent science sources, the Gulf is a contaminated and unproductive ecosystem. Like so many other of earth’s bountiful resources, sacrificed to the political exigencies of economic profit for the few. -How about the Great Lakes? Recent evidence of cumulative physical, chemical and biological threats shows that a host of positive feedback loops are contributing to increasing ecological instability. Combined threats including legacy and new industrial toxics, poorly designed and inadequate infrastructure including the uncontrolled and legal release of tens of millions of gallons of untreated sewerage, agricultural runoffs laced with toxic chemicals and fertilizer and pesticides, growing effects of climate change, and invasive species. Algae blooms and Lake Erie Dead Zones resulting from increased precipitation linked to agricultural practices and climate change are getting some attention but not enough. A relatively newly discovered plastics debris zone in Lake Erie more than rivals in density growing plastic patches in our oceans. The ‘Great Pacific Garbage Patch” just one of many in the Pacific, Antarctic, and Atlantic is more than twice the size of Texas. These ocean debris fields are huge vortex zones where plastics debris accumulate in recirculation gyres. These zones cause tremendous ecological damage and, as the plastics break down into microscopic particles, are ingested by fish and other wildlife, and humans. It is being newly discovered that these microplastics act like sponges that attract PCB’s, and PAH’s which are also know as Persistent Organic Pollutants (POPS). They can stay in the environment for over 50 years and bioaccumlate, or move up the food chain becoming more concentrated at each level. They are entering our bodies and there is evidence that they can be found in our brain cells and our spinal columns. As humans increase their dependency on plastics and chemicals, The Great Lakes, which account for more than 20% of the earth’s fresh water, are rapidly vanishing as a safe drinking resource. This does not mean that they are or will not remain a profitable commodity, because industry will find a way to make private money from this once shared public resource. Earlier this month Nestle Co. Chair Peter Brabeck declared that water is the most important raw material in the world and as such must be privatized and must not be considered a human right, but a commodity. He says, “Only extremists believe that water is a human right”. This is what is here. This is what is coming. A few years ago in their book Poisoned for Profit: How Toxins Are Making Our Children Chronically Ill, former New York Times chief environmental reporter Philip Shabekoff and his wife, the widely accomplished family and consumer activist Alice Shabekoff, investigated and chronicled how our economic policies have submerged our planet in a thickening haze of toxic soup. It tells how most of these poisons that have been made for profit come into our bodies via little studied exposure routes. It tells us that today in the United States one in three children are born sick. Most of these children will endure lifelong consequences of disease. The book comprehensively describes the health effects of exposure to industrially “produced for profit” toxics. The book details health consequences that include a widening array of birth defects, cancers, asthma, obesity, diabetes, mental and behavioral abnormalities, and other serious illnesses. The author’s research shows that the blood of newborns contain traces of nearly 300 synthetic chemicals. Milk from virtually every mother on the planet contains high levels of dozens of man-made poisons. Breast milk by almost all accounts is superior to other infant food, but the increase of toxins in breast milk is alarming. Other researchers have estimated that each human on the planet may contain traces of at least 700 human made toxins. According to the National Cancer Institute, half of all men and women living today will have cancer at sometime in their lives. One-eighth of all women will be diagnosed with breast cancer. These diseases are strongly linked to man-made toxins and environmental exposures. 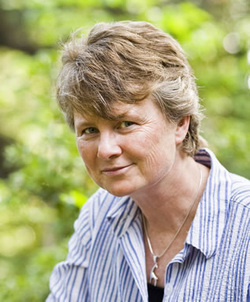 Sandra Steingraber, besides being a magnificent anti fracking activist, is a teacher, scientist, author, and parent. She is also a cancer survivor- a cancer linked to drinking water contamination. She has written several books including Living Downstream, and in her most recent book, Raising Elijah, which is about her son. In it she describes how thousands of man made toxics and at least 200 known brain poisons are allowed to flow freely in our economy. She reminds us that under the Cheney/Bush administration the oil and gas industry, -the fracking industry, were granted ongoing exemptions under the “Halliburton Loophole” or the Energy Policy Act of 2005. Exemptions include Clean Water Act, The Safe Water Drinking Act, the National Environmental Policy Act, and the Clean Air Act, the Federal Resource Conservation and Recovery Act. America’s worst polluters are exempted from America’s most potent environmental laws in the name of profit. Steingraber also reminds us that the Toxics Chemical Act of 1976, which the NY Times recently characterized as weak- Has provided for the study of only 200 of the over 80,000 known man made toxic substances, and that in no case does the TCA suggest that there are links with any of these 200 substances to human health Issues. Instead the “talking points” of industry and media are served with language indicating no known health links and that the materials are completely safe. Steingraber says that our economic politics promotes toxic substances to exist in our economic economy. There are indicators all around us that we are failing, and failing rapidly. You may have heard of Colony Collapse Disorder (CCD), a rapidly spreading spectrum of diseases killing honeybees, which pollinate our food supply. CCD is both an economic and human health disaster. CCD continues to increase with this last winter being worse than any previously reported. CCD is linked to the wide variety of chemicals that honeybees are exposed to- pesticides, herbicides, fertilizers, soaps, solvents, paints, plastics, and many thousands of other toxins found in our environment. Exposure vectors include drinking water, pollen, plant material, soil, air, and notably, GMO’s. Honeybees are the tip of the iceberg. All insects, all wildlife, all humans are on the path to a vanishing future. On earth today we are in what many scientists are referring to as the Sixth Great Extinction. It is a rapidly escalating extinction with 200 species on earth, vanishing every day, including today. Clearly some organisms, notably bacteria which make up over 90% of human volume, can and are adapting quickly. That does not mean that they need human bodies to survive. We live in a culture and society where our personal choices are limited by our fossil fuel dependence, our agricultural policies and practices and our ultimate dependence on consuming products that are across the board, demonstrably dangerous at every level manufacture, use, and disposal. If you want to be an activist, for the most part it is difficult to escape limited choices. We can make a difference by making consumer choices regarding energy, waste disposal, transportation, food, products, and consumables, but the choices are currently somewhat limited. Paper or plastic remains the standard for enlightened social choices. This is not enough to ensure that our children and grandchildren will have a quality of life legacy that will allow us to say we did all that we could. That is not to say that many are not engaged. Many are. Many people spend lots of time and energy in this fight and this is a bandwagon that is worth getting on. The recent success in New York by the WNY Clean Air Coalition in fighting Tonawanda Coke’s egregious malfeasance in releasing benzene into an urban neighborhood is a flag waiver. NYS DEC, with the assistance these citizen activists discovered that benzene levels in the air near Tonawanda Coke were 75 times greater than New York allows. Benzene is linked to blood cancers, including Leukemia, Lymphoma and Multiple Myelomas. But the company, and other polluters are protected still. Defending the emissions, Attorneys for Tonawanda Coke point to “other sources of air pollution that include the release of Benzene”, many of them permitted under the law. This will make linking specific victims to specific perpetrators for financial recovery difficult. In early April, Judith Enck, USEPA Region Two Administrator told Channel 4 News in Buffalo that while she applauds the work of the Clean Air Coalition “The Tonawanda Coke facility is still releasing large amounts of pollutants” and that “shutting down the plant right now is not in the picture”. She also said that Tonawanda Coke will be “carefully watched to make sure that they comply with the law.” Some releases of deadly toxics into the environment are legally permitted. U.S Attorney General Dennis Hochul, who is trying to establish a “Super Fund” for Tonawanda Coke victims, says that it will be difficult to prove a direct relationship between victims and the company, because there are other sources of Benzene out there. “Permissible under the law” is a fundamental issue. No one will argue that the standards under which permits for pollution are issued have become more restrictive since 1970 with such laws as Title V of the Clean Air Act that stipulates emissions permitting focusing on increased air quality standards. But releases are still permitted. Zero emissions are not on the near horizon. Across the spectrum of economic development, pollution in the name of profit is permitted. This includes legal air releases of Benzene and hundreds if not thousands of other cancer causing substances to the air and waters that we all depend on. Today, all regulations including and especially environmental regulations, are under attack by those that want to eliminate them, -period. Poisoned for Profit describes how these toxic products enjoy a complicated and dense web of legal protections. It details how private sector money has purchased highly paid lobbyists, scientists for hire, politicians, and policy makers to trick the public, often working secretly and behind the scenes, and almost always providing no accountability. It shows how legal and marketing strategies of gaming of the regulatory and safety systems has allowed the modern plague of profitable poisons. In our current economic system, the costs of the consequences to the environment and to society, such as the vanishing of bees and biodiversity and the costs of treating human illnesses are considered “externalities” which are to be borne by the overall society. These costs are corporate entitlements, which are borne by taxpayers and individuals, and not the producers of the toxins. These corporate profiteers reap vast economic benefit without regard to the consequential health and other impacts of that profit taking on society. This is true in Tonawanda, and it is true across the globe. Our political economic system allows pollution for profit. It is time that we start looking at the criminalization of pollution. It is important to note, as "Earth Days" come and go, that many organizations and individuals work hard every day and understand that every day is earth day. Steingrabbers focus on heroic narrative is substantiated right here in WNY. Besides the Clean Air Coalition, it is important to note other flag-wavers that use Earth Day as an opportunity to educate, inform, and engage. Among others, Buffalo Niagara Riverkeepers efforts to bring out the local community to use Earth Day as a vehicle to help clean up local ecosystems and natural areas including Times Beach Nature Preserve on Buffalo’s waterfront is an important engagement vehicle. There are a growing number of individuals and organizations in WNY working hard every day. This is something to be proud of for sure. But I am not and have not been for decades, ready for a “celebration” of Earth Day. That said, our current work, measured by the realities that we face on a degrading planet, prove that our work has not been enough. It doesn’t take a lot of brainpower to realize that Earth Day was long ago compromised by corporations and monied institutions looking to cynically greenwash their own tarnished actions, pitting economic development against ecological conservation, preservation, and a green future that represents something other than pure profit. It does take some significant brainpower and risk to break away from that worldview. In the world we currently politically support, the bottom line of sustainability is economics. In the real world that we live in and must find a way to help survive, the bottom line is the environment. This is a critical viewpoint that we need to adopt across the board. It will help us move ahead with our work to conserve, protect the environment and move toward a future that is sustainable for everyone. The radical choice this Earth Day is to demand that we stop legitimizing pollution in the name of economic development. It is killing us. We must ban fracking. We must invest in green infrastructure so that we can stop pollution. We must understand that a focus on an energy crisis, and an overwhelming environmental crisis, is really a consumption crisis. We must not allow the continuous manufacture of poisons for every product, including food, that sustains a continuous economic growth model that is killing us. We must change our consumer paradigms. We must fight for the future. Our lives and the lives of future generations depend upon this. Importantly must do this peacefully because the first rule of sustainability is peace. Like Ghandi’s Salt Satyagraha, we must radically alter our strategies and use the love of life to protect the lives of those that will come after us. Speaking out is important and even fundamental. Civil disobedience and direct action are options open to all of us. The radical choice is to break out of the opiate slumber, politicize ourselves to the point where we can challenge the status quo, and try to make a consequential difference. Remember this Earth Day- Sandra Steingrabber is in the Chemung County Jail standing up to the oil and gas industries continued aggression on our planets and our lives. Sandra says that at this very moment she is yelling at the iron doors that contain her. Can you hear her? She is doing this for love. She is doing this for us. Let us make sure that her love is not shared in vain. Authors Note: I first wrote the bones of this article in the year 2000 when I wrote extensively about the first rule of sustainability being Peace. Late last summer I began writing more about externalities, and the need to link economic externalities to both environment and social justice issues. I hope to do more of the later in the coming months. Sustainability involves the relationships between three core concerns- culture, economics, and society. Learning sustainability is about learning the complex interdependency between and amongst the three . Most people that understand sustainability know that the real bottom line is the environment. Unfortunately many people that advocate sustainability, do not understand or care about that. Most of our sustainability platforms rest exclusively in economics, and pay a trickle down attention to culture and environment. Across the board, economic growth and GDP is based on a consumer paradigm that promotes profit above all other factors. It treats culture and environment as exploitable commodities and markets rather than the immutable sustainability partners that they are. Sustainable growth, in this context, is an oxymoron. Most of our economic progress today is based on this trickling down from the Oligarchs and 1%, who want you to believe, that access to wealth for the many comes from the acquisition of wealth by the few. The problem with this equation is that today, as I am sure that you have heard, more than 99% of the worlds wealth is controlled by les than 1% of the worlds people, and that divide is continuing to expand today and everyday. According to the latest reports from the Federal Reserve, business profit margins have hit an all time high while wages have hit an all time low. Is this economic decline? What is trickling down on you and me and small local business is from the big “guys” that are eviscerating our capacity to have a sustainable future. Consequences of that trickle include a growing cascade of some pretty big picture items including climate change, expansive poverty and growing social unrest. Without peace there can be no sustainability. There is a lot of profit in war-making. Fundamental economic hegemony drives political and cultural disagreements, and war has driven economic “progress” for centuries. Contemporary global disaster capitalism, enabled by the shock of war and imposed austerity fraud are economic policies decided by the hidden hands of the free market and born in war. These deliberate strategies have brought us destroyed and displaced peoples, cultures, environmental obliteration, and climate change, which is the ultimate failure of the free market. Without peace there can be no sustainability. Period. Economic theory and practice is a political construct, not science. Contemporary economic practices place the costs of environment and social contexts as “externalities” outside the bottom line that is overwhelmingly prejudiced on determining profit and growth. In that way, the environment is measured as a commodity in that ecosystems such as forests are valued as measured by board feet rather than the ecological value of a complete ecosystem. A forest, a mountaintop, a river, lake, ocean, wetland is a complete ecosystem. Harvard biologist E.O. Wilson says, “Nature achieves sustainability through complexity.” Biodiversity champions life, and this is what makes planet earth unique. The externality factor distorts our economic fundamentals and promotes destruction of biodiversity, -the underpinning of life and makes Earth unique. We know through science and ecological economic measurements that a wetland is quantifiably more valuable than a parking lot, and a forest is more valuable than an industrial farm. Yet we use our planet as a sewer and economic measurements externalize pollution. We support short-term profit and growth while transferring the real costs of sustainability off to society. Ecosystems, through biodiversity, naturally clean waters, provide fertile soils, and stabilize the atmosphere. Poisoning the ecosystem through exploitation causes human health collapse and skyrocketing costs. An unstable atmosphere leads to disasters. The quantifiable loss of these services transcends global GDP by 1000% and more. That is measurable. Why is it an externality? David Suzuki calls conventional economics with externalities a form of “brain damage”. If we understand this, we can do much to reverse the myth of sustainability, but will we? Local economy, local green infrastructure, including adapting biodiversity support in urban development, conservation of energy rather than expanding consumption, waging peace, and land use reform which includes finding ways to incentivize protecting biodiversity and wildlands are strategies that we hardly think about, never mind engage in. We need leadership. Instead, everyone is enraptured by shiny objects in a false pursuit of happiness represented by buying more stuff that we don’t need. This includes me. This sustainability stuff depresses me and so I go shopping at Walmart to relive the pain. I bought four new pairs of cheap socks last week to replace the ones that wore out that I bought the week before. Go figure! If we are to advance beyond a myth of sustainability, we need to identify and defeat the destructive fables around economic growth that colonize and conquer at the expense of social and environmental sanity. Without new strategies, “sustainability” is simply another economic deceit that will trickle down on us until the rains of the collapse of civilization wash us all away into the unstoppable deluge of time. It wont be the first time that earth has made major adjustments. In this season of Peace on Earth, think about it. Without peace there can be no sustainability. Find ways to act. You can make a difference. Don’t forget to gift shop local. It may help you to emotionally work though our problems. New Years is soon. And buy local, because local owners care about their community and caring about our community is, as one of our constant media messengers tells us “HUGE”.